Khloe Kardashin calls off divorce from Lamar, Kris Jenner reacts. ~ CK Jacob: Nigerian Fiction And Lifestyle Blog. 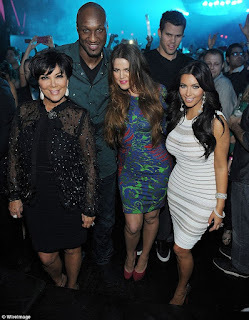 Khloe Kardashin calls off divorce from Lamar, Kris Jenner reacts. Khloe Kardashin filed for divorce from Lamar Odom in December 2013 after four years of marriage, following rumors of drug abuse and his admission to cheating on her. But after Khloe believes they can still work on the marriage after everything that has happened to Lamar. Kris Jenner surprisingly approves of her daughter Khloe Kardashian decision calling off her divorce from her ex husband. Kris also admits that she hopes her eldest daughter Kourtney can still make it work with Scott Disick, her former partner of nine years and the father of her three children.